I'm kicking off a four post series that takes a look into the process of a kitchen makeover. 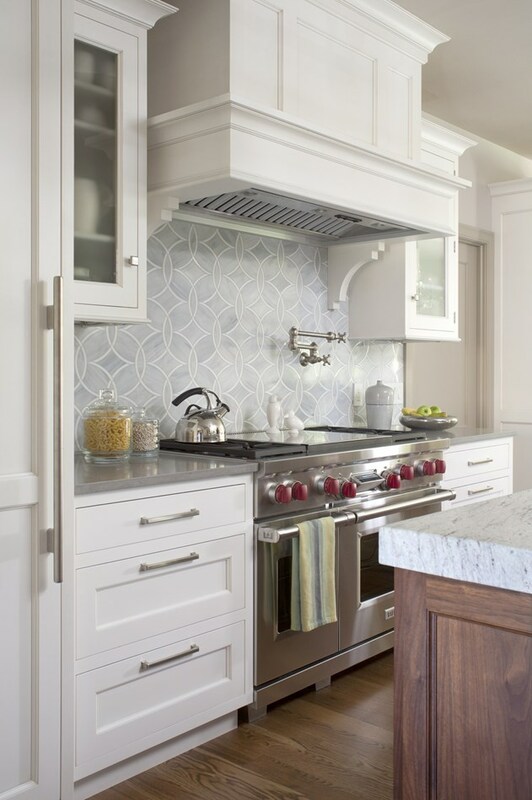 As a design professional, I know firsthand that for many homeowners the thought of a kitchen renovation is accompanied by anxiety over all the decisions that need to be made. In this series, I'll be sharing my advice and tips for each stage of a kitchen renovation to help put your worries to rest. Starting today with the very first step in a worry-free kitchen renovation, establishing your goals. Once you have clear goals in mind for your new kitchen, every decision you are faced with along the way will be easier to make. At the very beginning of your project ask yourself, "What am I trying to achieve in my new kitchen?" Write down your answer and post it somewhere for the duration of your project. It may sound silly but every time you need to make a decision, read your goal and the right choice will become more clear. Sometimes determining your goals requires some thought and research. If you are just beginning to consider a kitchen makeover, the Sub-Zero and Wolf Design Photo Gallery is a great place visit for inspiration. The gallery offers a ton of inspirational images and designer stories that could help you determine what your ultimate goals are for your own kitchen. For instance, I found these images in the Sub-Zero and Wolf Design Photo Gallery and they really spoke to me on a personal level. This kitchen was designed for a growing family residing in an open concept home. Many of the features in this space reminded me of my main objectives when designing my own kitchen makeover two years ago. In the very early stages of my kitchen project, I determined that I had two main goals. First, I wanted a kitchen that was conducive to busy family life. Secondly, I wanted our bland builder-grade kitchen to have a more custom look to match the custom detail applied throughout the rest of our home. Keeping these two goals in mind all the decisions that followed were easy to make. For example, when it came time to choose my new floor the options were endless. When I applied my goals to the vast array of products available, I was able to narrow the options down to the products that were ultra-durable and gave me the custom look I wanted. I ended up choosing a family friendly laminate that looks like hand-scraped hardwood. It is suitable for our lifestyle and it lends itself to the custom look I was after. The decision was made easily and I am so happy with our new floors. Another example was when we had to decide how to change our builder grade cabinets. I considered my goals of family friendliness and achieving a custom look and the right choice was obvious. I chose to extend the height of our stock grade cabinets with trim and molding to create the illusion of tall custom cabinetry. We finished them with an ultra-durable, washable paint which is a great choice for a family with small children. The concept of setting clear goals also holds true when I begin a kitchen makeover for a client. I always start by helping them define their goals. 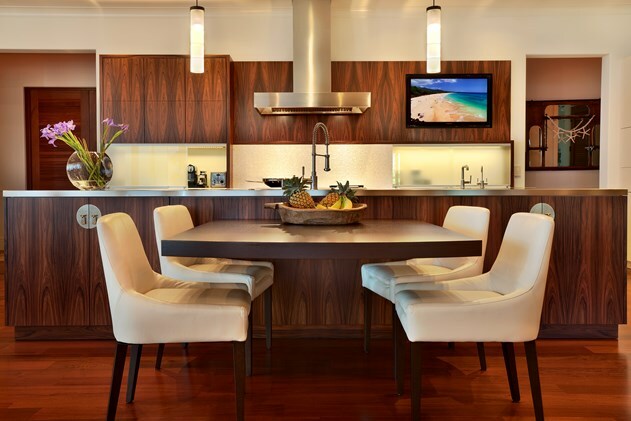 Some of the most common goals of my clients are, creating a kitchen that is conducive to family life, creating a kitchen that embraces a passion for cooking, creating an updated kitchen on a budget, creating a kitchen that depicts a certain style, or creating a space that works well for entertaining. If they are unsure of their goals or how they will translate into a new space, we will go in search of inspiration. The gorgeous images of this kitchen and the wonderful story told by the designer would be great inspiration for someone looking to design their kitchen around a passion for cooking. 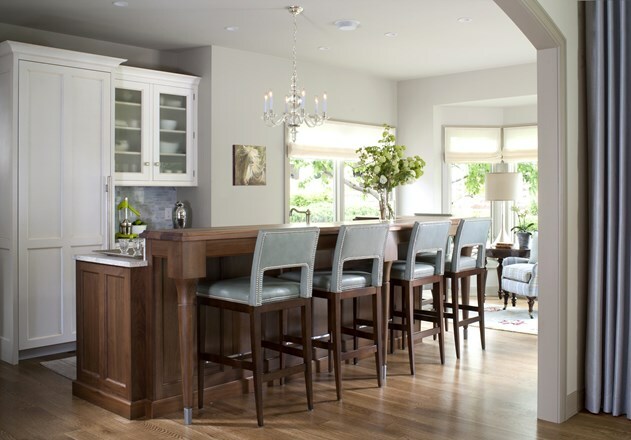 This kitchen was designed around the homeowner's love of hosting large parties and entertaining family and friends. So many wonderful ideas for creating a kitchen for the entertainer can be found in this space. This photo is a great representation of a kitchen that was designed with the goal of achieving a certain style. Visiting Sub-Zero and Wolf's Design Photo Gallery and reading through the stories of each project may help you understand what your goals are and how they can be achieved. Once your goals are established and written down, you're ready to move on to the next step in the kitchen renovation process. Stay tuned for the next post in this series where I will offer my tips for finding design inspiration and using it to create your kitchen design plan. 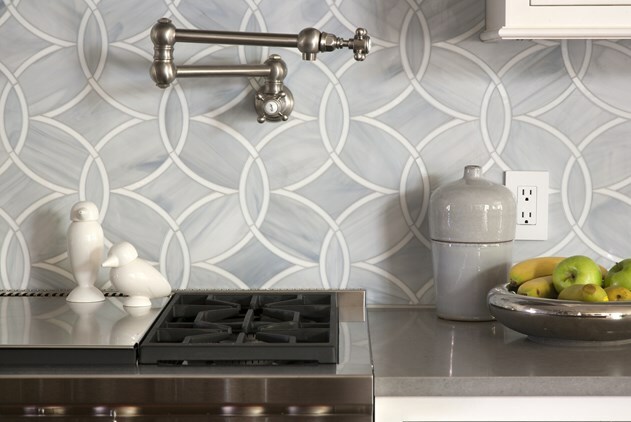 For a chance to win a $100 Visa gift card, tell me what your goals would be in designing your new kitchen? This sweepstakes runs from 3/17/2014-4/13/2014. Sarah! Perfect timing! Can't wait to design our new kitchen. My goals will be family-oriented (kid and dog friendly!) and adding a warmth to the space that I feel is missing now... Looking forward to transforming the most important room in our house! My goal is to incorporate an island for my kids to eat/ do homework while I am cooking. My goals would be family friendly, more cabinet space, a pantry area, and all around great place to hang out! I would do a bigger, arched window over the sink and a gourmet type oven. We have a beautiful kitchen, but if we were ever to do it again, these would be the two things I would definitely include. 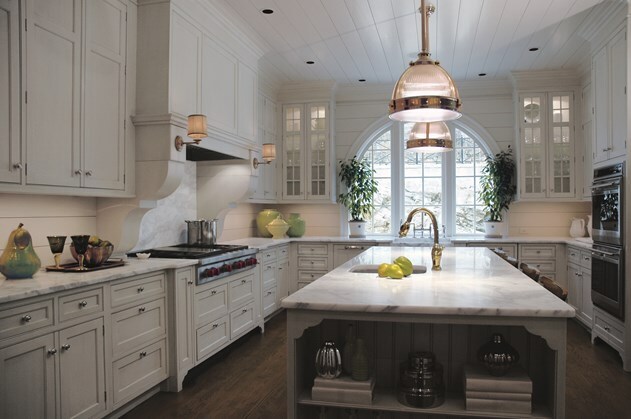 I would include a large arched window over the sink and a professional type oven/range. We have a lovely kitchen, but if we were ever to do it again, I would definitely include these two things. Lisa S. - oh what wonderful advice! Doesn't everyone want a warm, welcoming kitchen to entertain guests while we cook? my goal would be more storage! our home is 80 years old and we have to keep a lot of stuff in our basement since we don't have a lot of storage space. We remodeled our kitchen (total gut job) ten years ago, and thankfully, I still love it....except for the dark granite counters. (lots of them....) If I were remodeling I would go for a much lighter look. I've been thinking about remodeling my kitchen for years. My goal is to knock down the wall that divides it from the living room so that I am not shut off when cooking. It will also give me much needed counter space so that my kids and I can do more cooking and baking together. I cannot wait to knock down that wall! I would love to design a new kitchen. My goal would be to be family functional. I would redesign it to have appliances more spread out I find my boys are in the frig while I am trying to get to the oven. We need a more cohesive kitchen design! I have been making plans for new kitchen. One thing I want is a double stove so that I can roast and bake at the same time. Then I want to cook top elsewhere so that I'm not standing over some blazing thing while I'm preparing the sauces and stuff. My goals for designing a new kitchen would be 1) Smart storage so everything has it's place, and 2) A personal and meaningful design. I am in the midst of designing a new kitchen for new home and i learned a lot from my kitchen remodel a few years ago. I was able to try finishes and appliances used in the remodel to know if i wanted to incorporate them into the new home kitchen. I definitely still want granite and would love an island. I enjoy your blog and decorating style. thank you for this giveaway oppty! My goal would be to knock off the high top counter that is in my center island that divides my kitchen and eating area, and houses the sink. 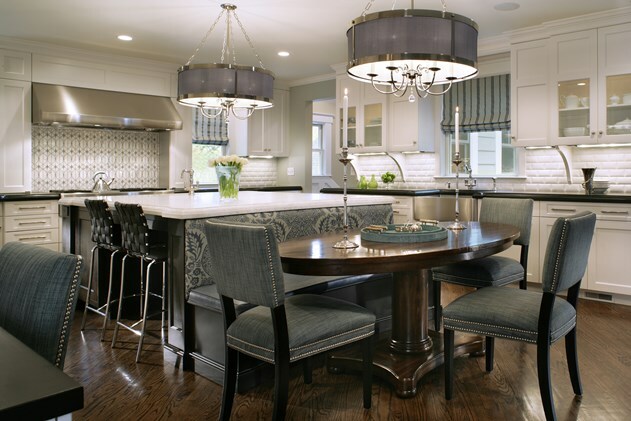 I would prefer to have the counter top at all one level and be able to pull up stools to the other side and have little helpers join me or the conversationalists while I am working on the other side. I would love to remodel our kitchen and get away from the cookie cutter look! Your kitchen is beautiful!! We are going to partially remodel our kitchen. The challenge is I hate the counters and back splash but that can't be changed. The cabinets are custom made and I love them. The floor is going to be replaced and the fridge and dishwasher. The dilemma is that the people who owned the house before us built in an old fridge -- it is small and finding a little one to fit in its place will leave our choices almost nil. Well that's what downsizing does for you. I will be posting on my blog. I have always loved your blog! I have (stealthily) followed you for a while. Love the post, beautiful as always! Amazing inspiration. Oh I dream of having an island! That would be awesome for food prep. I love my kitchen except for my tile counters!! My goal is to replace those with granite counters to make clean up a lot easier! Oh the plans that I have for our kitchen... but as far as design I want it to be traditional, functional and attractive. I would like to have a bar where someone could set and talk to me while I am cooking or we could eat there together. Our goal in remodeling our kitchen would be to make it a fun and warm place to hang out. This would mean replacing our counters and a new oven at least! My kitchen does not invite people to gather comfortably. I want a family friendly space with good flow. I would love great storage, durable surfaces and a small soft space (like two soft reading chairs) for my kids to land and hang out with me while I cook. My goal would be providing a lot of space for preparing food as well as hosting family, and functional yet nice looking appliances. Great series, very helpful! Kitchens are so intimidating to me and ours definitely needs to be redone in the coming years. I would like it to be functional for our family with 2 young kids, include a ton more storage and a pantry (which we now don't have). I also want it to feel more comfortable, cozy and warm, with room for fabrics and patterns and accessories that make it inviting and feel more like a room than just a work area. Thanks for the giveaway! I am currently designing my kitchen renovation. My goals are durability, ease of use and simplicity. My budget helps keep my dreams grounded. The most important thing for me is more cabinet space, and more accessible ways to use them. That would be so nice! Your kitchen is so beautiful. If I could redesign our kitchen my goals would be to add more cabinets and way way more counter space. My goals in a new kitchen design would be more counter space, more cupboards, a pantry, new appliances and an eat-in area in the kitchen/family room. My goals in a kitchen remodel would be more counter space, more cupboards, new appliances and an eat-in area. My main goal in designing a new kitchen would be to ensure adequate areas to prepare different dishes, for example I currently struggle for a dessert prep area when making the main course. I would also love a built in oven! This is a great post! I am currently weighing whether we should remodel or move. Our kitchen is one of the reasons I want to move. :) I want our new kitchen to be light, bright, and family friendly. Large dining area, restaurant style prep and stove area and an island with a marble top. Thanks for this post! I do need to re-design my kitchen to give myself more counter/food prep space. A recent addition to the house has messed up my footprint and now I am slowly gathering ideas to tackle the kitchen. 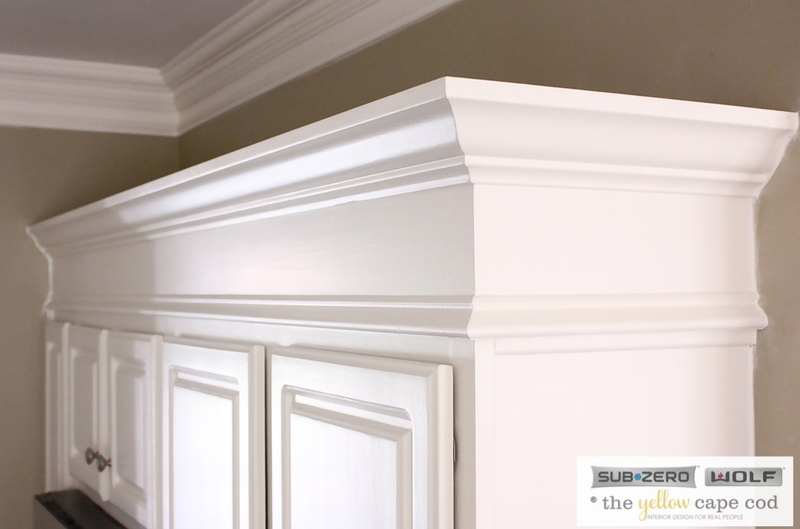 Love your idea about adding onto your additional cabinets with the molding, thanks for sharing it. The photo galleries have had great inspiration also, thanks for sharing them also! I'd plan for more storage. Great post! I also have white cabinets and black counter tops. :) Love the look. I need new stools for my island and pub table... that's 5 matching stools! 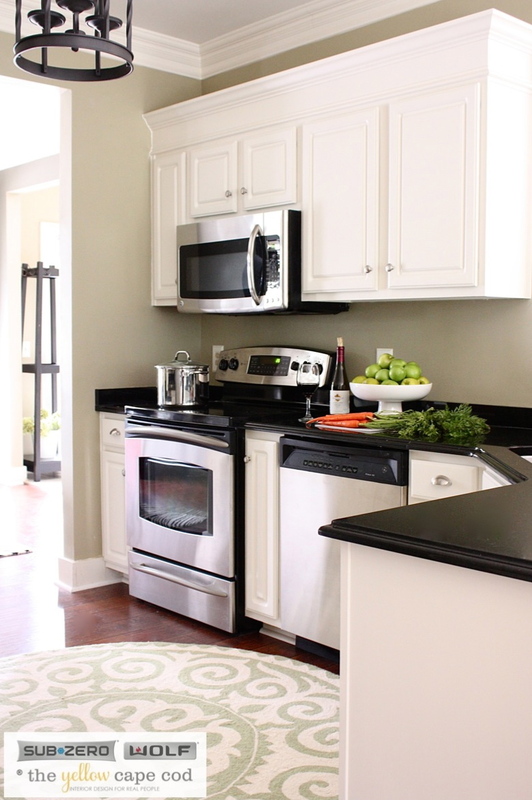 I love the white cabinets and black counter tops, that's my kitchen style also :). My latest goal is matching stools for my the island and pub height table -- that's 5 stools! Open, easy to clean (no tile!) and lots of storage. My kitchen would have white cabinets with white subway tile and an area to have people sit & hangout while I cook. My kitchen would have white cabinets and white subway tile and a place for people to sit while I cook. I'd love a slab countertop of some sort. Cleaning in grout is no fun when it comes to food prep and cooking! I would have a large open space, lots of cabinets for storage, lots of outlets, energy-efficient appliances, easy maintenance counters and floors. My goals for a kitchen would be better function with an updated style! My kitchen is stuck in 1996. I have painted the walls which definitely helped but now I need new door handles and countertops (forest green, ugh!). Oh and a way to convince my husband that honey oak is not timeless. He will never let me paint them but even a darker stain would be better than what we have currently. I would just want more counter space and better appliances. A large kitchen island and a dual fuel range are goals in designing my new (dream) kitchen. My primary goal is functionality and ease of use. I want butcher block counters, but I'm afraid of upkeep! A large island where my family can gather together and storage!!! I would love to design a new kitchen. My goal would be to update the countertops and get all new appliances. .I would also love to add an island for extra storage and counter space. A better way to fit two people in the same kitchen. Ours is small and my husband and I are always stepping on one another as we move around. My goals would be a larger kitchen, new appliances, and storage space. Great ideas! We are getting closer to starting our kitchen project and I was just looking for some 'getting started' tips. Thanks! Great tips! I would love to update our countertops and backsplash. I really enjoyed reading your ideas! I would love to create better flow and storage and open up our kitchen. I'd love to have lots of counter space and since my husband and I both love to cook, two prep areas with 2 sinks would be great. My goal in designing a new kitchen would be a very open space. I would knock down some walls so that the kitchen flowed into the family room. I need a food processor and I would also love to have a wok. I would love to get brand new kitchen appliances and install nice granite countertops and an island! I could use a new refrigerator and a nice stand mixer. I love to make French Onion soup from scratch. I would like to have energy saving appliances. My goal would be to make my kitchen more "user-friendly". We need our kitchen to be updated, with new floor, new cabinets, new appliances, new paint, and new countertops. My goals would be to update the appliances, lighting and hardware and install Silestone counter tops. I would like to reface my cabinets and get a new kitchen table so the look is more modern. I'd like to redo my kitchen floor in white marble. I want my next kitchen theme to be "clean" and simple, yet cheerful. I'm think of light yellow, mint green, and white with a hint of retroness. My goal would be to do SOMETHING with my ugly cabinets. I'd like a open concept kitchen and more cabinet space. I would love to have a new stand mixer! I would love a kitchen that flows and has lots of pantry room, and also lots of good lighting and counterspace. I want to add more light to our kitchen & increase cupboard and countertop space. we need new everything in the kitchen: appliances, cabinets, dining set, and flooring. My goal would be lots of storage space and updated appliances. I would love more storage and counter space in my tiny apartment kitchen! To have more room and storage space would be mine. I would love to have a 50's kitchen. It would be black, red, and white. And chrome too! I'd love more of a pantry space. And I'd love to do what you did and paint my old, boring fruitwood stained oak cabinets and give them some life! And marble or tiled counters would really put a smile on my face! i would love all new appliances, stainless steel with granite counter tops!! I want energy efficient appliances, as well as more cupboard space!!! My goals would be to have a place for a table and chairs, right now one lone stool barely fits in it. Then I would love to have a pantry close by and it would be wonderful to get the microwave off the counter and built in to the wall. We did our kitchen last summer. My goals were to make the new look old. Well, actually make it look like it belonged in our 100+ year old house. I also wanted to make sure the finishes were durable and easy care. Plus I needed a fridge with 2 icemakers. And I got it all. My goal would be to add more cabinet and counter space. I would like to have an island added for eating at and better lighting. I love my kitchen and it is so close to becoming my perfect dream kitchen. I would love to add additional lighting accents and turn my breakfast nook into a more functional seating area because everyone always ends up in the kitchen! One main goal would be to have ample counter space. I would change the linoleum floors to wood and put in wood cabinets with more storage. My goal would be a fancy stove with and griddle built in. My goal would be better cabinet design, a double oven and a more user friendly pantry, a true walk-in pantry. My goal in designing a new kitchen would be more counter space. I need more cabinet and counter space. My major goals in designing a new kitchen are updated appliances! I would want stainless steel appliances, more counter space and better counter tops. I would definitely want bar-style seating. Maximize space. I have a pretty small kitchen with next to no counter space. I need room to prep in! The goal is function! We did a total kitchen remodel five years ago and at the time I did not want an island. You know what they say about a woman's prerogative to change her mind. Is that remark ever more true than in the world of construction, design and remodeling? I am currently in the contemplation and design process of all things kitchen island. Functional countertops, ice maker, deep drawers, service sink- I'll take it! The biggest thing I'd like to do with my kitchen is to install new cupboards below the counter. I'd like to replace the ones above with open shelving. The only other thing would be fresh paint on the walls which I have already purchased. I just need the time to get to it. Well, I rent so I can't do much in the way of redesigning the kitchen but I'd love to have one with enough counter space so that more than one person can work at the same time. My goals would be to have a large center island with bar style seating. My goal would be to increase the amount of counter space and add an island with seating. My goal is to at some point install new cabinets. Mine are shot. I would love for my kitchen to look more modern. I would want to update the cabinets and I would love a bigger fridge with more room on the side doors. Easy clean with plenty of room. My goal would be to make it efficient with everything easily accessible. I have yet to have a kitchen that meets this goal. My kitchen looks like it's right out of the 70's. My goal would be to expand, update, and beautify. My fiance would like the kitchen to have everything needed to be top chef in there. I would love new stoves. I would love to add concrete counter-tops. I need more cabinet space/storage. I love the last photo and need to redo my kitchen. Thanks for the hints! A new sink/faucet. New fridge/freezer. No cat litter box under the table. Fresh flowers on the table. My goals would be to have new appliances (25 years is old) and to lighten up the dark wood cabinets. My goal would be more storage for kitchen gadgets and canned goods etc.